So I think this will be the last post in the graphene back-stories trilogy (if you haven't been reading along, here are parts 1 and 2). It has been rather self-indulgent to keep writing about my own research interests; especially since I got in to this as a way to motivate me to learn more about what's going on outside my own field. That being said, when somebody publishes something cool about graphene, I'll still be on the case! ​Selected topics in graphene, part 1: why isn&apos;t it invisible? Today's post is going to be about Raman spectroscopy and its application to graphene research. The amount of information you can glean about a graphene sample from a 10 second Raman spectrum is astounding. You can tell how many layers thick it is; the abundance of defects in the sample; and whether it is electron rich or poor. Now I know I said previously that choosing the correct substrate allows us to see graphene, so we don't have to use the atomic force microscope to search for it, and that remains true. But the human eye is not a particularly reliable tool for distinguishing the contrast between a single atomic layer and two atomic layers. Through a microscope, they look like 'something really faint' and 'something maybe slightly less faint'. That's where Raman spectroscopy comes in. We can confirm whether the graphene is single layer or not in 10 seconds. Less, I suspect, if you have access to a better Raman spectrometer than I do. So what is Raman spectroscopy? Well, wikipedia is a good place to find out all about it. I'm going to give you the absolute bare-bones description here. Essentially, you shoot a laser at your sample (how all the best science starts). One of the incoming photons excites an electron to a higher energy level. Most of the time, that electron will then drop back to its ground state and emit a photon of the same wavelength as the one that came in. But sometimes, that incoming photon interacts with molecular vibrations as well as promoting an electron, and then the emitted light will be at a different wavelength — either because some of the energy has gone into vibrating the lattice or some energy has been absorbed from the vibrating lattice. The difference in wavelength between the two photons gives information about molecular vibrations and thus structural and electronic information about the sample. Figure 1 is the Raman spectrum of graphene. I am not even going to pretend to feel competent enough to give you an explanation of the exact lattice vibrations (called phonons) that give rise to those peaks, but let's just appreciate the simplicity of that spectrum. Only two peaks and yet so much data! The rightmost peak, called the 2D peak, changes shape as a function of number of graphene layers. With one layer, the peak is sharp. With two layers, the peak is broad and actually a convolution of 4 individual peaks in the same area. With 5+ layers, the peak narrows again and becomes a convolution of just two peaks. Figure 2 shows what I mean. Additionally, the ratio of the two peak heights is telling. Single layer graphene of good quality tends to have a righthand 2D peak much taller than the lefthand peak, called the G peak. In thicker layers, that ratio is reversed. The G peak also moves as a function of doping in the graphene. That is, it will move left if the graphene has extra electrons and it will move right if the graphene is electron deficient. Finally, a third peak, present in all graphitic materials, is called the D peak and is found left of the G peak. 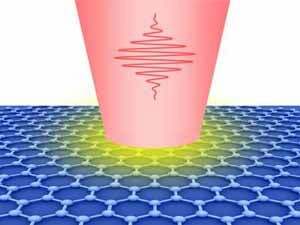 Its intensity gives a measure of graphene defects. Remember how graphene's mobility comes from that giant orbital cloud above and below the plane? Well every time there is a disruption in that cloud, the D peak gets bigger. So there you have it — so much to be learned from such a quick and simple measurement. And useful knowledge if you want to be able to critically analyze graphene articles. When graphene got really popular, there was an influx of reports in the literature of graphene-like-things ("reduced graphene oxide" [typed with thinly veiled scorn] is a very common example) that lack the really neat properties of single-crystal graphene. They may look like graphene under the microscope, but always take a look at the Raman spectrum before you interpret the results. Is that D peak enormous? Is the 2D peak broad or made up of several overlapping peaks? That, my friend, is no graphene.